The wood anemone, anemone nemorosa, re native to UK with small with stary flowers in shades of pale to dark violet-blue. They have curious slender rhizomes and are very easy to naturalise in humus rich soil under trees or shrubs.The rhizomes are planted horizontally in the autumn just below the soil surface and must not at any time be allowed to dry out as they quickly dessicate. In eastern Europe they give way to the beautiful golden form. 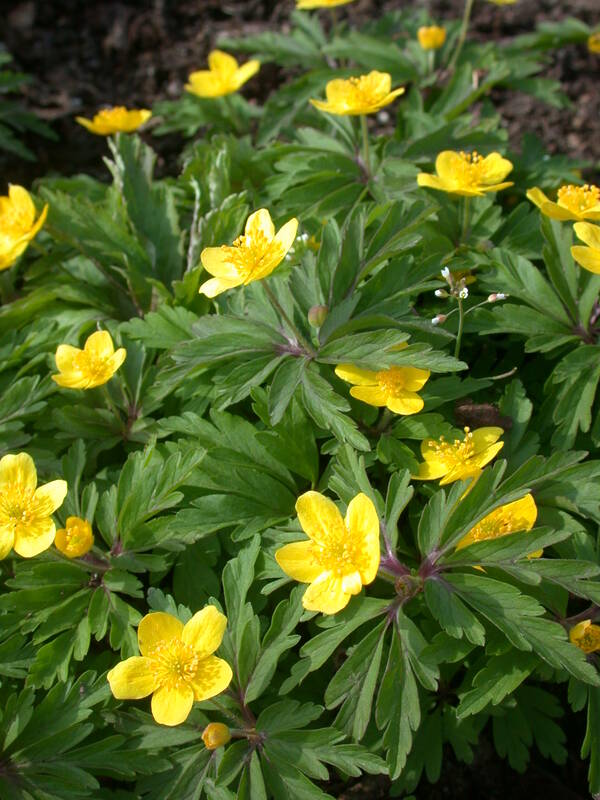 In Japan the wood anemone has larger flowers and leaves but is just as easy. The tiny Anemone blanda comes from Greece and thrives in full sun and will seed vigorously to form a carpet under small trees. The most common form is blue but there are white and pink cultivars.It is excellent with tulips in pots where its ferny foliage helps soften the top of the pot.Summer dormant. Height: 4" and flowers: Feb-Mar The tubers are planted in the sutumn 2" deep. Click here for an article on growing bulbs in shade. Very large showy white flowers which last extremely well. Very easy to naturalise on a rock garden. Plant the tubers in autumn in a sunny position.Summer dormant. Perfect for massing under tulips in containers or at the front of a sunny border. (Wood Anemone). A superb form of our native wood anemone with very large pale blue flowers on slender stems and divided leaves. Excellent for naturalising under trees and shrubs. Plant the rhizomes in autumn but do not allow them to dry out first or they will die! (Wood Anemone). A superb form of our native wood anemone with very large white flowers on slender stems and divided leaves. It has exceptionally 'fat' rhizomes and is very distinct. Probably the tallest there is. Excellent for naturalising under trees and shrubs. Plant the rhizomes in autumn but do not allow them to dry out first or they will die! (Wood Anemone). A superb form of our native wood anemone with dainty deep blue flowers on slender stems and divided leaves. They are not too vigorous and smother themselves in flowers. Excellent for naturalising under trees and shrubs. Plant the rhizomes in autumn but do not allow them to dry out first or they will die! (Wood Anemone). Our native wood anemone with dainty white flowers on slender stems and divided leaves. Excellent for naturalising under trees and shrubs where they can spread to form extensive patches. Plant the rhizomes in autumn but do not allow them to dry out first or they will die!